yes there are many cheap clones out there. Only buy from scantool.net to get a real OBDLink LX. ebay is full of counterfeit obdlink devices. Barbagris wrote: Does anyone know why I do not have any reading in the Ah field? Trying to update the firmware of the STN1170 OBD2 I toasted it. 32,2 Ah at 81.000 km. It's a 2011 car. Nominal rated cell capacity is 50Ah, but the BMS on the car does not charge the cells to 100% (4.2 volts per cell) but only to 4.1 volts per cell. Depending on what reference you take as gospel, 4.1 volts on a cell chemistry that is 100% charged at 4.2 volts is about 90% charged. If this is the case, the usable cell capacity brand new will only be about 45Ah, and certainly not 50Ah when the cells are only charged to 4.1v. Evbatmon apparently uses a figure of 46Ah, so for lack of a better figure I have been basing my degradation measurements on 100% SoH = 46Ah. I have a Lexia 3 PSA dealer diagnostic tool that works with the Ion and C-Zero (but not i-Miev) and I have been gathering the Ah figure from that - even the official diagnostic tool provides no guidance on what Ah capacity a new car should have. Next time I have a long weekend and don't think I'll be needing to use the car for a couple of days I might just try it to see if the Ah figure changes! Aerowhatt wrote: Perhaps just give it some time. I know that when I plugged my wife's "i" into the canion app it did not register AH for hours if not a day or more. If memory serves canion was monitoring a charge cycle when it popped up. Looks to me like it's canion that stores the history etc. So from what I saw the first reading took a while to show up. From what I've read, all data displayed by Canion is provided by passive monitoring/snooping of the CAN bus only - so its likely that the Ah figure is only transmitted on the bus (and thus passively sniffed) very rarely, perhaps only when the BMS has done a recalculation of the Ah figure and is transmitting it to the instrument cluster ECU to update GOM estimates - which is likely to only occur during at the end of a deep discharge followed by a 100% charge. Hence Canion is probably caching the last known value (or showing nothing if it hasn't seen a figure broadcast yet) until it sees a new update broadcast on the bus, so if you aren't running Canion all the time including during all charge cycles it may "miss" changes to the figure, causing the figure to appear to stay the same for a long time if you only use Canion occasionally. When I use my PSA diagnostic tool (Diagbox on a Lexia 3) it queries the BMS ECU actively for the figure so I can always get an immediate up to date Ah figure when I go into the standard parameters measurement section on the ECU. I suspect evbatmon also does an active query rather than the passive monitoring of canion. DBMandrake wrote: Nominal rated cell capacity is 50Ah, but the BMS on the car does not charge the cells to 100% (4.2 volts per cell) but only to 4.1 volts per cell. Depending on what reference you take as gospel, 4.1 volts on a cell chemistry that is 100% charged at 4.2 volts is about 90% charged. That fits very closely with my estimate that only 90% of the cell capacity is usable when charging to 4.1 volts, since 0.9x50 = 45. So it would seem reasonable unless we see other evidence to the contrary that the new 100% SoH usable capacity of these cells is around 45 or 46Ah. Also interesting is that the faulty pack had done 40k miles, which is what my car has just passed recently, and had an Ah capacity of 38.4 remaining - mine was 38.9Ah at 38,000 miles, and I intend to check soon to see what it is now at 41k miles. The temperature reading is not correct as Canion doesn't read cell temp (and cell voltage) at all at 2015 I-miev and later. Interesting, I wonder if there is a difference between the older LEV50 cells in my car and the LEV50N cells use after mid 2012 ? Perhaps 46Ah is the correct figure to use for a "new" battery then. It can't be 50Ah as the cells are only charged to 4.1 volts, so using 50Ah as the starting figure would make it seem as if even brand new cars had significant degradation! Re: CanIon doesn't work for 2015+ ? Is this really true? It is the first i have heard of Canion not working for later models, and would indicate that Mitsu changed the CAN PIDS for these measurements. Have Martin and Xavier been made aware of this? kiev wrote: Is this really true? It is the first i have heard of Canion not working for later models, and would indicate that Mitsu changed the CAN PIDS for these measurements. Have Martin and Xavier been made aware of this? I have a 2016 (USA), and CanIon doesn't provide complete information like it does for a 2012 model that I checked. EvBatMon also misbhaves on my car, but worked fine on the older model. 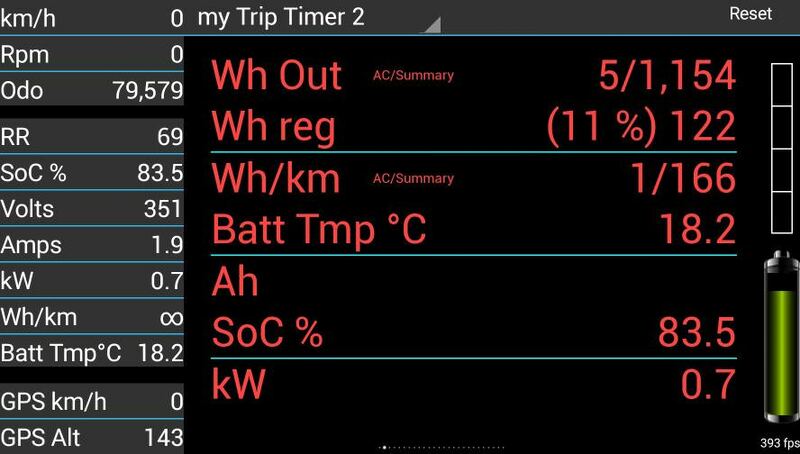 I e-mailed Martin, and he responded with: "i got response from other i-MiEV-owners missing Batt Status & Batt Temp infos. I also checked one special car with canion in diagnostic-mode if missing data are moved to other PIDs. But these data are not available anymore on just listening cars can-bus at newer vehicles (Mj. 2016+ ?). I’m sorry. Maybe it’s feature on newer cars now and it’s possible to activate this via garage-tool from Mitsubishi? Please ask your garage therefore and let me know their answer." What's weird is that EVBatMon does seem to show cell voltages and Ah, but the values jump around like crazy. I suspect that the app is mixing up the data fields or something. JoeS wrote: Barbagris, my fairly old STN1170 from AH Design works just fine using CaniOn v141 and gives me Ah reading. I WAS WRONG! What I was seeing was the stored Ah reading from previously using the OBDLink. No wonder my Ah reading had not changed for a year!